Chiavari in Liguria has become the home of my heart. I love living in my little one-bedroom apartamento near the sea (il mare). My pint-sized gas range works just fine. My frigerifero (refrigerator) is larger than many in Italy. The bed is huge, if a bit too firm. And, best of all, I can reach the sea with a 2 minute walk. Who could ask for anything more? Well, I could ask for just a bit more. When I left Arpino and my cousin. Sonseere, 2 suitcases worth of clothing and other incidentals remained with her. I could not take it all with me to my Italian Homestay, my travels with my girls and then to Chiavari. On March 30th, I packed my backpack with a few necessities and headed for the Chiavari train station. I hopped on the first of two trains and headed back to Arpino, Sonseere and my STUFF. When I left Arpino to begin my Italian Homestay in Maremma, it was only the 23rd of January. Sonseere was still staying at the hotel and in the process of firing her remodeling contractor. She had gone through so much with this crooked contractor that she needed to grow a spine of steel to get rid of him. Thankfully, she managed to do that prior to my leavetaking, and things were looking up for her. While she, with the help of her Realtor partners and friends, replaced the workers and moved into her home I was having my own exemplary adventures. Now it was time to check on my cousin’s progress and wellbeing and to reclaim the items I carried from the states. It was so good to be with my cousin again. Sonsi and I are more than cousins. We are friends. I was excited to see her and wanted to assist her in settling in. And, honestly, I wanted to eat at those wonderfully inexpensive restaurants she has found in and around Arpino. 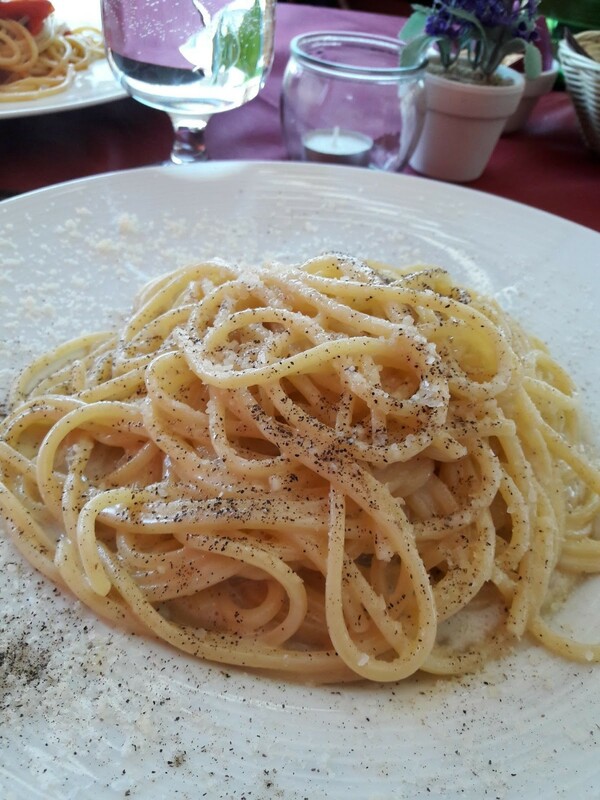 I especially wanted to eat Cacio e Pepe, a traditional Roman pasta dish that I crave. Sonseere is also a fabulous cook herself. Unfortunately, with only one burner, big meals were a challenge. Did I forget to mention that her kitchen was not yet completed? That she had a lovely refrigerator but had purchased one electric burner to make dinner? That she had been waiting for her kitchen for months and she had several sets of dishes, flatware and cookware still in boxes? Sonseere has had quite the challenge putting her life together in Italy. She will be filling you in on her adventures and misadventures soon. For now, let’s say that she has been learning about her personal strengths for months. I had planned to only stay a week or so before returning to Chiavari. Yet it was difficult to leave. Every day, Sonsi and I either cooked a nice meal (with or without kitchen) and we talked about everything. I realized that for a couple months I had hardly been speaking English whatsoever. It was a relief to converse in a language that I am fluent in. But my Italian did get rustier the longer I stayed in Arpino. Oh but the conversation and the food. Fresh lettuce salad every day, sometimes with huge red peppers cut up and added, other times with fresh tomatoes. Always with EVOO and Balsamic vinegar from Modena. YUM. Gnocchi with Pomodoro and Parmesano Reggiano. Once the kitchen was installed we were both so excited that we began to plan what we would cook next. Sonseere has 6 burners, 2 gas and 4 electric convection I believe they are called. Water heats in maybe one minute. Her cooktops are on her island. I could work from one said and she the other. All was going well until we turned the kitchen light on as it darkened outside. Boom, we flipped the breakers. “Oh,” he told me in a condescending fashion, “that’s not necessary. And that is not how we do it here in Italy. She has plenty of electricity. She upgraded it. No problem. Don’t worry.” Until Sonseere gets rewiring done in her gorgeous gourmet kitchen, she cannot use 2 electric burners and a kitchen light at the same time. Her entire kitchen is on one circuit. I used the gas burners. That was fine with me. I made Calabrese Tomato sauce with the red Tropea onions. We took turns making sauce fresh every day. And, on occasion, we dined out. I stayed so long with Sonseere in Arpino that I was able to enjoy a traditional Easter dinner with our cousins, the Buzzelli family, in Avezzano. It began with a frittata and assorted meats as aperitivo. Our primo piatto was a wonderful pasta and we were drinking wine, of course. Luigi explained in Italian that the traditional pasta served on Easter would have been a ravioli with pecorino cheese. But it was not his favorite. We also had a wonderful Easter bread to go along with our meal, all courses. Our secondo was a breaded veal cutlet I believe and vegetables. It was wonderful. Finally, we had the traditional, cross shaped sweet bread for dessert along with caffe’ and fruit. The two college age children said their farewells after dessert and we headed to our home town of Origin, Paterno di Avezzano, and to the home of Luigi’s mother, Lucia. Lucia has a touch of dementia and did not want to leave her home. But she was excited to see us. We loved seeing her. I remember Lucia as always the most welcoming person, and one who worked to speak Italian and not dialect with us. This time we could hear the dialect quite a bit more. When she had heard that Sonseere was living in Arpino, she told us a story of how her mother would walk to Arpino to buy soft material made there. She also told us of the time she received a package of cotton from family in the United States. Inside the cotton were hemp seeds. She called it cannabis but specified that it wasn’t the kind you smoked. We all burst out laughing. It was so cute. She said her mother had told her to spread out these seeds to feed the chickens. Apparently the chickens didn’t eat them all as hemp plants popped up all over Paterno. They used it as a complementary fabric to the cotton. Remember though it was not the kind you smoked! Shortly after Easter it was time to pack up and return to my home. Now I had two giant suitcases plus my backpack to carry on the train. Sonseere graciously drove me to Roma Termini where I nearly missed my train. I needed assistance getting them on and off the train. Thank goodness people helped me. I think I was nearly carrying my own body weight. While on the ride home to Chiavari, my excitement was building. I realized that as much as I loved being in Sonseere’s big apartment and sharing time with her, Chiavari has become my home. As we approached Chiavari I cornered a handsome train conductor to ask for his assistance getting the two heavy bags off the train. He agreed to help me and would return when we stopped. All the while I had been speaking in Italian to him. Yet, as he picked up the larger bag, he turned to me and said in English, “What do you have in here, your dead husband?” I burst out laughing. He did manage to get that one and the second one down the stairs from the train. And then he disappeared quickly. Two kind strangers helped me to carry these monstrosities down and up the stairs. I then dragged them to a taxi driver and off we went to my home. Even at home, the taxi driver brought them into the apartment hallway, up a few stairs and right to the door of the elevator. I gave him a big tip. Now, I have my flashlight, my 2 insulated glasses, paperwork for my business and details for my writing. I have photos of family members, I have winter clothing and boots. I have 2 pair of fancy shoes and a jar of Peanut butter! I have been cooking in my kitchen for a week now. I buy fresh food and decide what to do with it later. It always changes. As does the sea that drew me here in the first place. On that train-ride, on my way home, I thought a great deal about il mare, the sea. 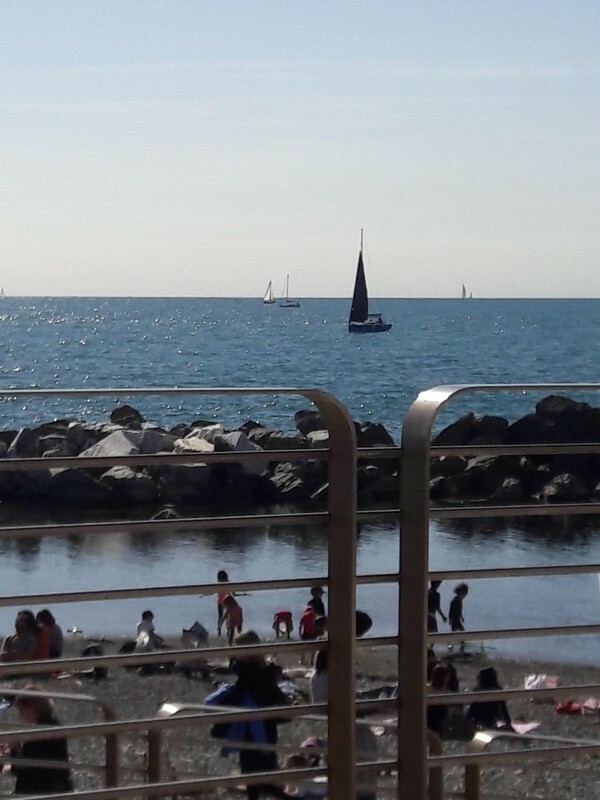 For me, I believe the sea is like an Italian person. Some days it is calm, clear and enchanting. It gently caresses the shoreline as an Italian greets you with a loose hug and air kisses. Other days, she seems calm. Yet, when you least expect it, a burst of wind adds emotion and the waves move harder toward the shore. It is somewhat unpredictable but not dangerous. And then there are those days when the storm clouds cover the sky, the wind sings and the waves crash into the breakers with such power that you jump back without intent. These are the actions of an emotionally charged, highly expressive Italian about to lose his or her well-prepared cool, her bella figura. She will definitely kiss your cheeks and give you a close hug. He or she or the very sea becomes wild, out of control, completely unpredictable. I love that about the sea. It is my favorite expression that the sea can offer. I think I enjoy Italian people when they are like the wild wave too. It is temporary and powerful. The emotion of it all is undeniable. I am a wild woman who loves the wild wave, loves the power and loves the excitement of the experience. And it is there for me, a 2 minute walk from my door. I have returned to the sea. I am home.